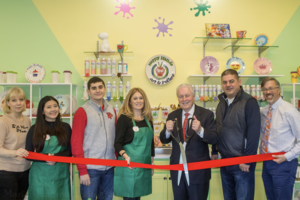 Fairfield, CT - The Fairfield Department of Community & Economic Development has announced the opening of Happy Hands Art & Pottery, which celebrated the official opening of its location in Fairfield with a ribbon cutting ceremony on Friday, October 26th. Happy Hands Art & Pottery is located at 85 Mill Plain Road, within the Fairfield Sportsplex. Fairfield First Selectman Mike Tetreau and Economic Development Director Mark Barnhart were among the dignitaries and other guests on hand to help Owner Alla Ionescu mark the occasion. The Fairfield studio is the third location for Happy Hands, which has similar facilities in Wilton and Shelton, and represents a bit of a homecoming for Alla, a long-time Fairfield resident. Happy Hands Art & Pottery is a paint-your-own pottery and clay studio in which people of all ages can create their own masterpieces. The vibrant design of the studio represents a clean and green environment. The studio offers a wide variety of programs ranging from birthday parties, after school programs to ladies nights and fundraisers. The studio always strives to deliver the best in customer service while also creating an atmosphere of relaxation and creation. Being privately owned and family operated has allowed for the studio to grow in ways that Alla had wanted to from its inception as an idea from her then eight-year-old daughter who loved to paint. Happy Hands hopes that this new location in Fairfield will allow for new artists to share their experiences and use the studio to their advantage as a place in which creative projects can be born. "We are thrilled to welcome Alla and Happy Hands Art & Pottery to Fairfield. Small businesses like hers are what make Fairfield what it is, and we wish Alla and the rest of her team much success in this latest endeavor,” stated Mark Barnhart, Director of the Department of Community & Economic Development. For hours and more information about the studio, please visit their website www.hhpottery.com or their Facebook page, www.facebook.com/hhpottery/.